Settling in Canada can be stressful. What’s more, if your family had a long journey to safety, it’s common to still feel fearful. However, this can lead your child to feeling fearful, too—and that can result in stress. 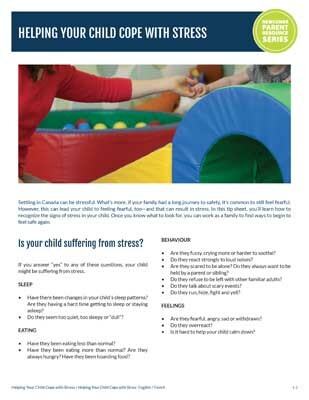 In this tip sheet, you’ll learn how to recognize the signs of stress in your child. Once you know what to look for, you can work as a family to find ways to begin to feel safe again.